Dual Living at its absolute best! Seldom do we find a property with a list of features as extensive as this. When we say this home needs to be seen to be believed we certainly mean it! Stunning in presentation, this fabulous dual occupancy property is an absolute one of a kind. Featuring a charming main home with four bedrooms, family bathroom, generous kitchen and open plan living arrangement and gorgeous floating timber floors. The second dwelling boasts an impressive living zone, full kitchen and bathroom, generous laundry and two bedrooms. A idilic front porch is the perfect was to spend an afternoon and both properties are independent of each other and offer plenty of privacy. Outdoor entertaining is an absolute delight with a sparkling in-ground pool and poolside cabana. Shedding and car accommodation is in overdrive with a double carport for the main home, large 20m x 12m barn style shed with four bays and 3 phase power and an extra height carport for caravans or boats. There is also plenty of additional parking for trucks or machinery if required. The block is a fully fenced 4163m2 yard, flood free, bursting with mature gardens that are an absolute delight. Situated in a quiet court location and easy access to shops, local parks and schools. 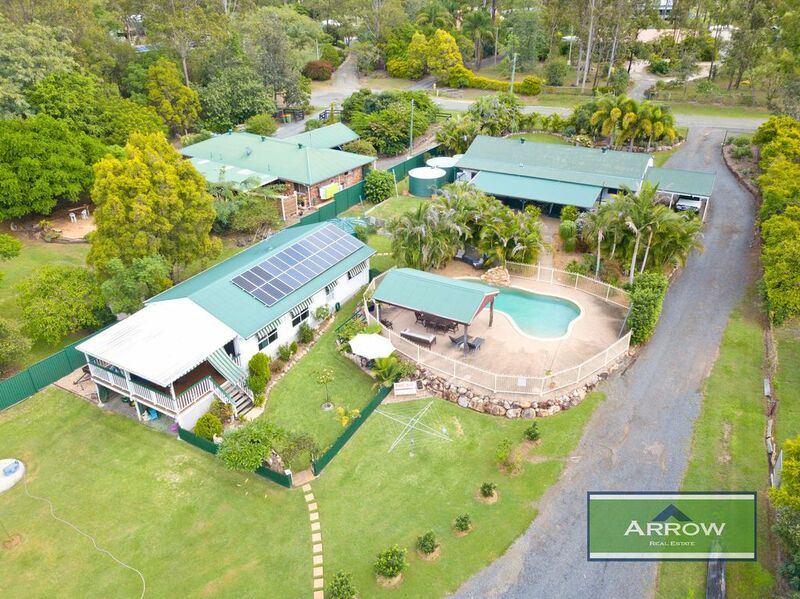 50 Minutes to Brisbane and access to Mt Lindesay Hwy.